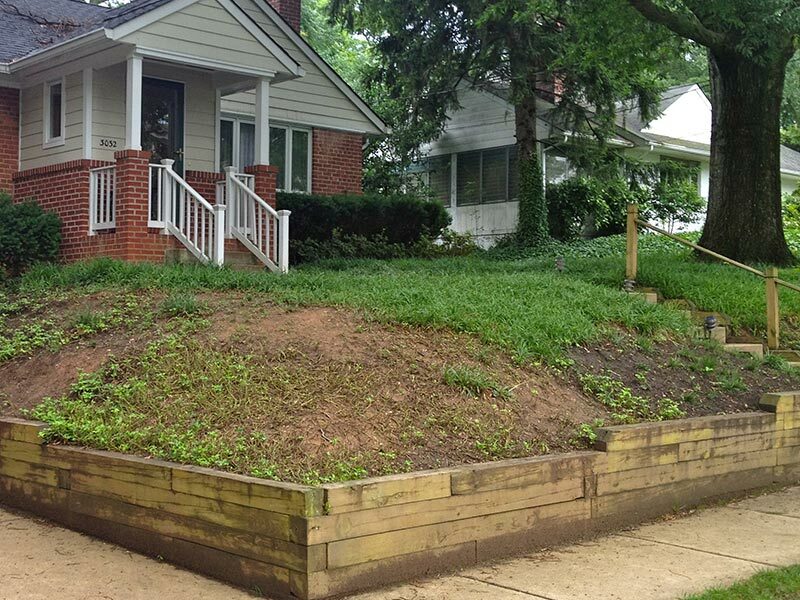 As the “before” picture illustrates, this North Arlington property features a charming home in a nice neighborhood. But when we began the project, the landscaping and hardscaping made it appear uninviting and detracted from the charm of the house. 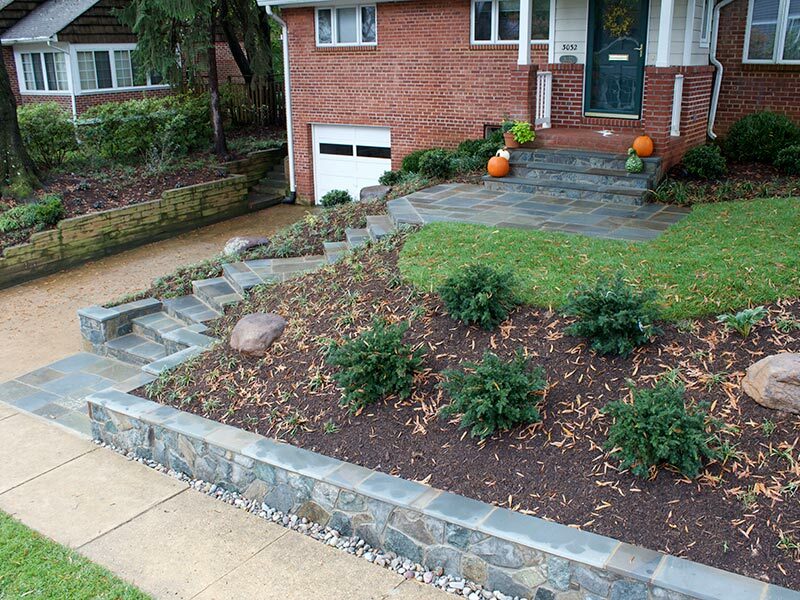 So we cleared the existing hardscapes and set about creating a new home walkway design to improve usability and flow within this North Arlington landscape. 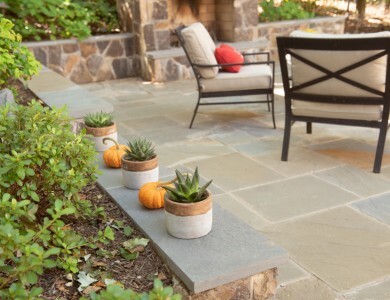 We began to tackle the challenges at hand by removing the existing landscape as well as the hardscaping, including the walkway and walls within the home entrance. Then, we re-graded the front hillside to create a gentler grade between the house and the street before beginning construction of the new features. 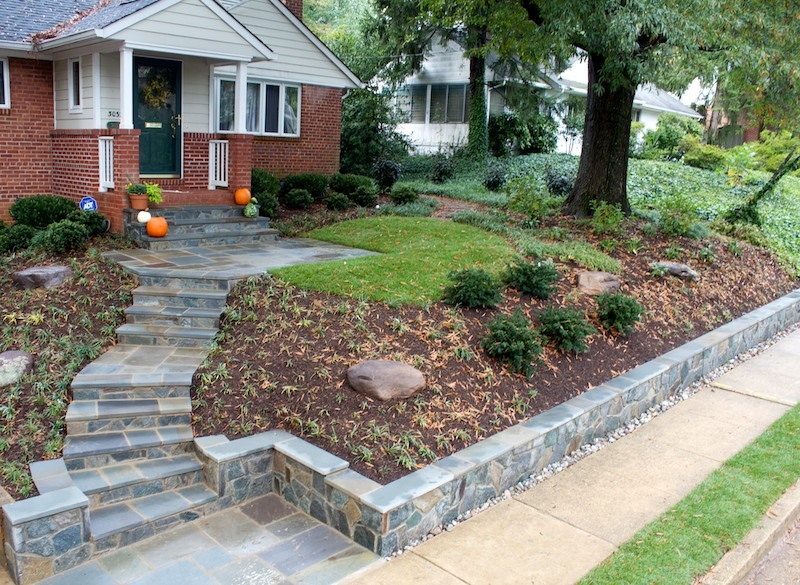 Next to the sidewalk, we built a short wall that retains the new slope and acts as additional seating for the kids playing on this quiet cul-de-sac in North Arlington. 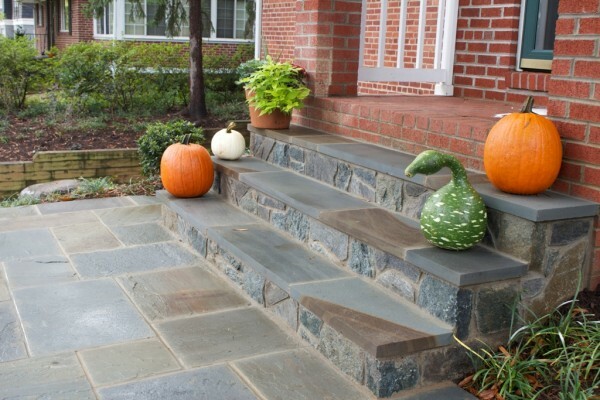 We also designed and built a series of steps and landings to be both functional and attractive, connecting the road to the front door in a unique home walkway design. 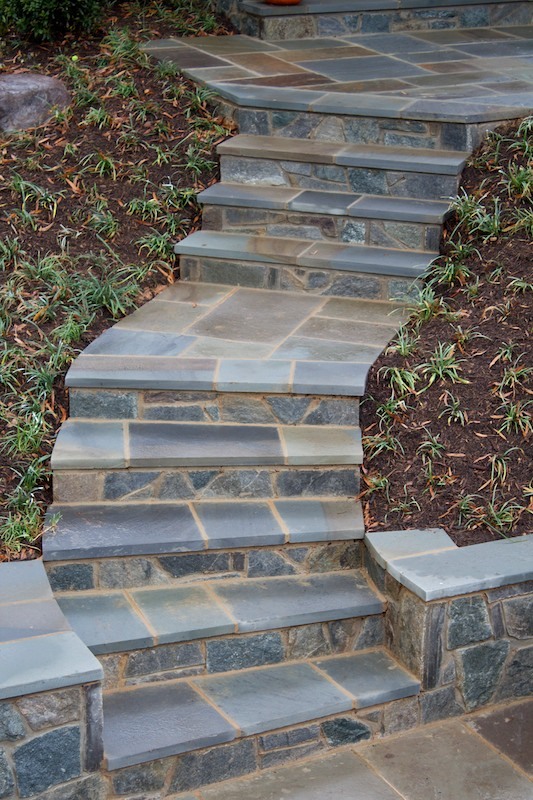 We built this series of steps and landings, as well as the wall, with a mix of Carderock Building stone and Dove Gray Building stone, and used a cap made of the ever-popular Pennsylvania Flagstone in all the above hardscaping elements. 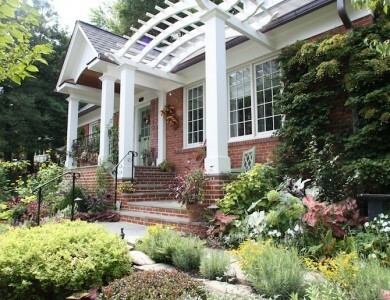 We completed the home entrance by landscaping the front yard with a selection of kid-proof, low-maintenance plants, primarily consisting of Liriope groundcover. 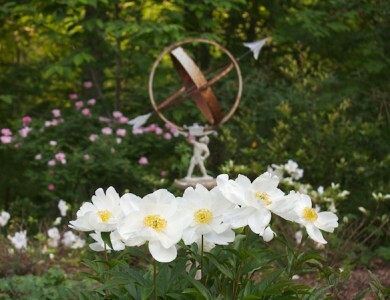 We also installed plantings that have low-growth habits so our customers wouldn’t have to worry about constant pruning. 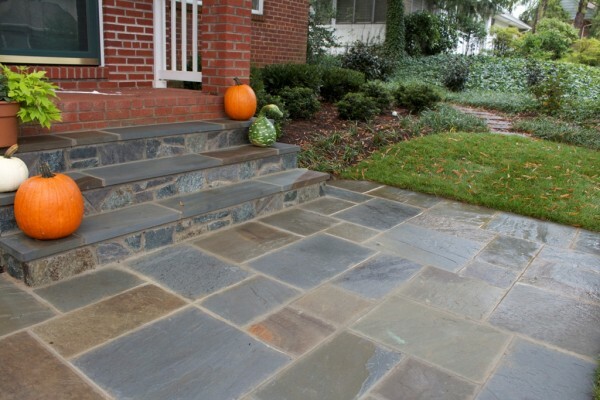 Finally, this landscape matches the charm of the home and the neighborhood! Do you have an inefficient home walkway layout or hardscaping design like our clients in North Arlington, VA? 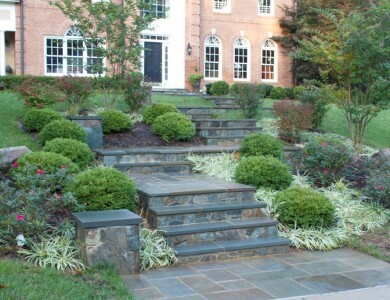 Whatever your landscaping needs may be, O’Grady’s Landscape can help you renovate your landscape to bring out the charm in your home and improve functionality. 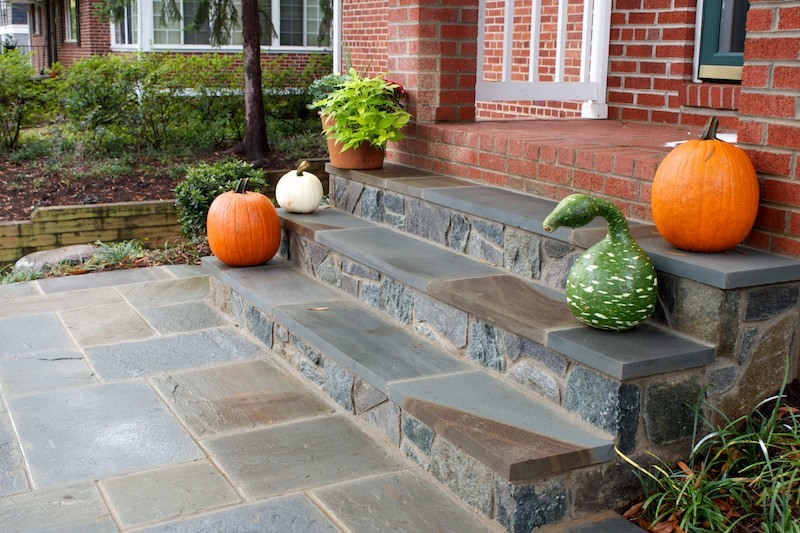 Let us create the inviting home entrance you’ve always wanted—call us today at 703-533-5001 to schedule a consultation in the Northern Virginia area!